Scattered Thoughts On Books. : Medic Against Bomb: A Doctor's Poetry of War. 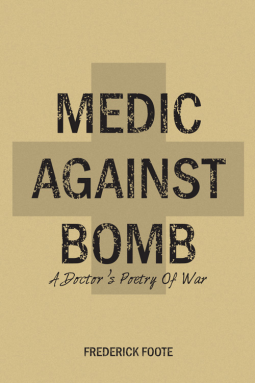 Medic Against Bomb: A Doctor's Poetry of War. Many of the poems developed from the author’s experiences on the hospital ship COMFORT, where military medical personnel cared for mostly Iraqi patients Medevac’d to the ship. Other poems emerged from the experience of caring for sick and wounded American servicemen and women, and for their families. Thanks to Netgalley.com and Grayson Books for providing me with an advance Ecopy of the book for review purposes. This is included in my 2014 goodreads.com reading challenge. Medic Against Bomb is a collection of war poems from retired US Navy physician Fredrick Foote, and is mostly drawn from his experience of working on the US Navy ship COMFORT. The Poetry is presented in a no nonsense straight forward fashion. It pulls no punches on what Foote saw and felt during his time there. Often thought provoking the poems deal with numerous traumatic and disturbing subjects and Foote manages through his poetry to give the subject the Gravitas it deserves. As with any collection of poetry not all the poems are equal in length and quality. The book does suffer from the occasional dip in this regard, however, the quality of the writing shines through in most of the poems. The book whilst short more than makes up for its briefness thanks to the quality held within, and its subject matter makes it an excellent read. A modern take on the poetry that the likes Siegfried Sassoon And Wilfred Owen pioneered.